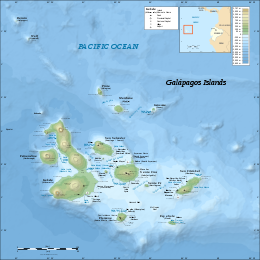 ^ "History Of The Galapagos Islands Facts & Charles Darwin History". www.quasarex.com. Retrieved 18 October 2018. ^ Mittlestaedt, Eric; d'Ozouville, Noemi; Harpp, Karen; Graham, David (2014). Harpp, Karen; Mittelstaedt, Eric; d'Ozouville, Noemi; Graham, David (eds.). 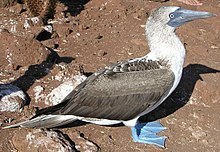 Introduction, in The Galapagos: A Natural Laboratory for the Earth Sciences. Hoboken: John Wiley & Sons, Inc. pp. 1–3, 42. ISBN 9781118852415. ^ Harpp, Karen; Hall, Paul; Jackson, Matthew (2014). Harpp, Karen; Mittelstaedt, Eric; d'Ozouville, Noemi; Graham, David (eds.). 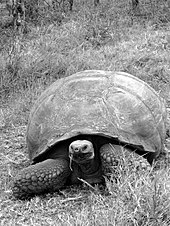 Galapagos and Easter: A Tale of Two Hotspots, in The Galapagos: A Natural Laboratory for the Earth Sciences. Hoboken: John Wiley & Sons, Inc. pp. 27–29. ISBN 9781118852415. ^ a b Geist, Dennis; Bergantz, George; Chadwick, William (2014). Harpp, Karen; Mittelstaedt, Eric; d'Ozouville, Noemi; Graham, David (eds.). Galapagos Magma Chambers, in The Galapagos: A Natural Laboratory for the Earth Sciences. Hoboken: John Wiley & Sons, Inc. pp. 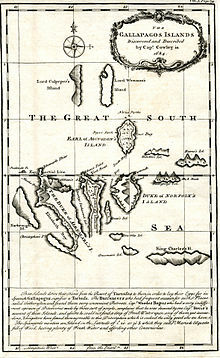 56–57. ISBN 9781118852415. ^ a b Poland, Michael (2014). Harpp, Karen; Mittelstaedt, Eric; d'Ozouville, Noemi; Graham, David (eds.). 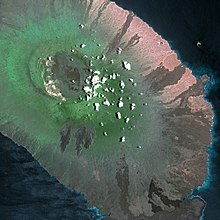 Contrasting Volcanism in Hawai'i and the Galapagos, in The Galapagos: A Natural Laboratory for the Earth Sciences. Hoboken: John Wiley & Sons, Inc. pp. 5–21. ISBN 9781118852415. ^ Merlen, Godfrey (2014). Harpp, Karen; Mittelstaedt, Eric; d'Ozouville, Noemi; Graham, David (eds.). 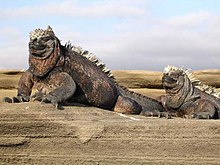 Plate Tectonics, Evolution, and the Survival of Species: A Modern Day Hotspot, in The Galapagos: A Natural Laboratory for the Earth Sciences. Hoboken: John Wiley & Sons, Inc. p. 122. ISBN 9781118852415. ^ Kurz, Mark; Rowland, Scott; Curtice, Joshua; Saal, Alberto; Naumann, Terry (2014). Harpp, Karen; Mittelstaedt, Eric; d'Ozouville, Noemi; Graham, David (eds.). Eruption Rates for Fernandina Volcano: A New Chronology at the Galapagos Hotspot Center, in The Galapagos: A Natural Laboratory for the Earth Sciences. Hoboken: John Wiley & Sons, Inc. pp. 41–44, 49. ISBN 9781118852415. ^ Latorre, Octavio (1995). 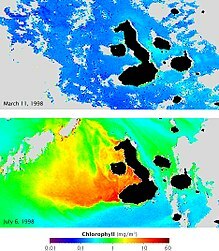 "Los tesoros escondidos de las Islas Galapagos" (PDF). Noticias de Galapagos (in Spanish) (55): 66. Retrieved 21 February 2018. ^ "The Norwegian Who Inspired Darwin". ThorNews. Retrieved 15 July 2016. ^ "Invasive Species". Galapagos Conservancy. Retrieved 1 June 2016. ^ a b "Project Isabela". Galapagos Conservancy. Retrieved 21 December 2016. ^ a b John (5 March 2015). "Project Isabela: When Slaughtering 250,000 Goats Meant Saving A Species". All That Is Interesting. Retrieved 21 December 2016. ^ Cisneros-Heredia, Diego F (22 February 2018). 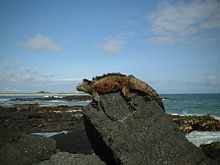 "Non-native small terrestrial vertebrates in the Galapagos". PeerJ Preprints. doi:10.7287/peerj.preprints.26563v1. ISSN 2167-9843. ^ "Post-Rat Eradication and Monitoring on Pinzón". 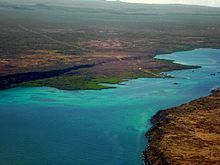 Galapagos Conservancy. Retrieved 21 December 2016. 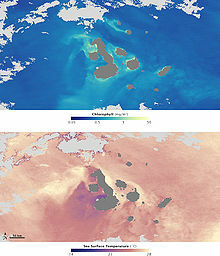 ^ "Galapagos: El Niño and La Niña". Retrieved 9 November 2018.